I came across this article that may seem off topic, however it's applicable to many celebrities. A major issue has been escalating for some time, as many celebrities (or their PR teams) were manipulating their public image even on social networking sites through spam accounts as "followers." Twitter can identify the spam accounts. Many are easy to detect. George Clooney doesn't have a Twitter account as he's probably above social networking, like many of his peers. Or simply has no time. The "fake Twitter followers concept" is usually the domain of those trying to establish their popularity. In relation to GC, (as this is a fourm about him), it's possible Stacey Keibler's & Elisabetta Canalis' PR would use these deceptive methods. Just a hypothesis. Sitting cross-legged in the leather chair of my home office, it took me fifteen seconds to find someone who was willing to sell me 2,500 “quality Twitter followers” to boost my account — for the low price of about $25 bucks. The followers would arrive in three days and stick around for the whole year, more than doubling my current follower count of around 1250. I felt pretty comfortably smug about myself, especially considering I’d gotten this far by dumbly typing in “How to buy Twitter followers” into my Chrome bar. I leaned in, determined to make the transaction, and tried to convince myself to click the button. Turns out, buying followers is probably the worst kept secret in all of social media — and it has a potential for a nasty and public backlash. Presidential hopeful Mitt Romney experienced one such scandal in late July, when his Twitter automagically garnered 116,000 followers in a single day; suspicious, no? Wow! Very interesting. Our world just keeps getting weirder and weirder! Thanks for the article. It will be interesting how Twitter resolves this. Live Tweets is its whole appeal. 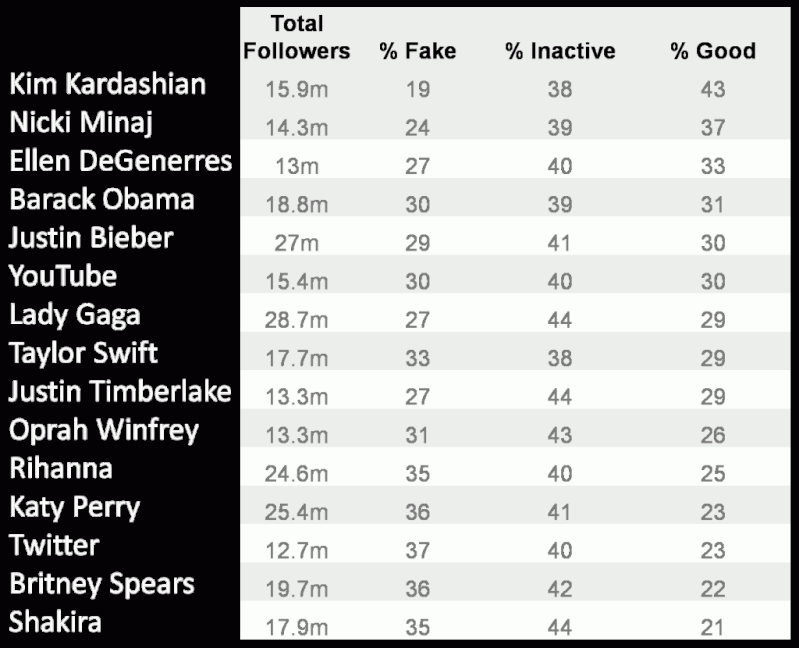 Forbes magazine has the a list of celebrities with the most fake followers. SAY IT AIN'T SO JOE? KK with child is leading?? come on SK CAMP, You can't let her lose to her new BFF KK! "I should do that....I only have 88 followers....."
God Silly Girl, 88 followers sounds really impressive to me! I was shocked by the headline: “71% Of President Barack Obama‘s Twitter Followers Are Fake.” By this measure, of the President’s nearly 19 million followers, 13.5 million are bogus. Irrespective of your political affiliation, one must admit that nearly three-fourths is an extremely high percentage of phony followers, causing some pundits to suggest that shenanigans may have been employed to bolster the President’s social status. And The Most Authentic Twitter Personality Is…? President Obama’s troubling Twitter follower score caused me to wonder to what degree other leading Twitter personalities’ followers were largely nonexistent. To this end, I used StatusPeople’s online tool, which estimates the percentage of followers which are: Fake, Inactive and Good. The results were surprising. The arguably least-authentic personality on the list, Kim Kardashian, has the most legitimate followers of the Top 15 Tweeters, with 43% of her Twitter fans judged by StatusPeople to be real and active. Ms. Kardashian’s genuine percentage is more than double that of the lowest ranking member of the list, Shakira, with a paltry bona fide estimate of 21%. Even more disheartening, Ms. Authentic herself, Oprah Winfrey, per StatusPeople’s ranking, placed a mediocre tenth place, with only 26% of her followers extrapolated as real and active. The following list is ranked from the highest to lowest percentage of real and active Twitter followers, not by each celebrity’s total followers. StatusPeople notes that their results are inexact, as their algorithm samples a portion of a Tweeter’s followers and then extrapolates relative percentages across the entire data sample. In addition, pioneer Tweeters with longstanding Twitter accounts are more apt to have a higher percentage of inactive users. However, given that all of these are mature Twitter accounts, it is safe to assume that the results are accurate/inaccurate on a relative basis. Where Do Fake Twitter Followers Come From? There are a number of services which sell fake Twitter followers for the socially deficient. Prices range from $10 for 1,000 auto-generated Twitter followers to $1,350 for 1,000,000 counterfeit followers. The other source of fake followers are spam bots which follow users with the hope they will receive a reciprocal follow, which allows them to send spammy direct messages to the Tweeter. At first glance, the extremely large percentage of inauthentic followers is rather astonishing, given that the average Twitter account has a fake percentage in the single digits. Yet, I am not suggesting that any of the above celebrities purchased bot Twitter followers, nor do I have any direct evidence that this is the case. Although one can imagine that the temptation to cheat is strong among handlers responsible for managing a celebrity’s social media network. shows you just how fragile their egos are! Never knew their were fake followers. I just have two. You got me beat BluBelle! I only have one and I don't even know who it is or how they found me!!! Mel, I know how you feel! I've only got 18 and don't know any of them but 1. Think they find you when you post to a site they're watching for marketing purposes. I tweet to a lot of US journalists and political folks. So I've ended up with a t-shirt maker and a political blogger. At first it was a little odd to me but you don't have to follow back and you have the option to say no. I've gone and blocked a few because some are just down right weird. Mine are mostly people in publishing. A few friends but that is it. I would tell you my twitter name but it is my real name, which I thought was a good idea at the time. I know you know better SillyGirl, but DO NOT post it here. If you want anyone to have it, they can PM you. Just watching out for you! Well yes, this may come as a shock to someone, but you can easily buy “quality twitter followers” to boost your account or friends to the facebook, also clicks “visitors” to your page. If you don´t overboard no one can tell a difference. In my one (of the many) email accounts I get constant facebook alerts, invitations to invite these people to be my friend. So far I haven´t recognized any of them + I don´t have an account. And other friend just joined in, sharing her lunch experiences now and how it is going with her husband… She also runs a kennel and set up a homepage for it. Asked me how many visitors, followers etc. she should get for her package (yes, they have a package deals now) and I said million sounds good figure. Good start. I know Melbert I sometimes forget and sign my real name to stuff....luckily I remember before I hit send. When I started my blog and twitter I did so because I wanted possible employers to find me. I still do but realized I can't respond to things on twitter because there is no anonymity. Can't have everything. I don't think I will buy followers though----seems unethical to me.